The old Strong House, beneath its towering sycamore tree, attracts the admiration and excites the interest of all visitors to Amherst. 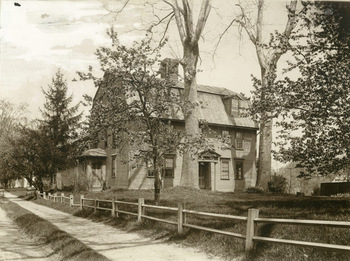 It is not only the most picturesque dwelling, but is the home of the Amherst Historical Society. It dates back to the time of the French and Indian wars, and stands today a perfect model of the architecture of that period and a monument to its builder, Nehemiah Strong. Houses in those days were meant to last for generations. With this in mind, having observed the homes of certain of his friends in other towns, Nehemiah Strong made plans for his new dwelling. The house should have the fashionable gambrel roof, and spacious, low-ceiled rooms, and great brick oven and fireplaces, in which the massive back log should smoulder through the night and furnish embers for the morning blaze. All these and other details were settled in his mind before the owner of the land shouldered his axe, and with his neighbors went into the woods near by to cut great forest trees and draw them to the spot. Willing helpers aided in the task of hewing into shape the massive timbers and splitting the clapboards for the covering of the frame. The foundations were laid on the north side of the broad highway, and then the invitations to the raising were sent by word of mouth to neighbors far and near. We may well imagine that many distinguished persons gathered on this occasion, which afforded opportunity for social festivity as well as strenuous toil. Each side of the building firmly fastened together, was lifted by united effort and held in air until the wooden pegs were pounded home and the whole frame was in position. Then a nip of toddy, accompanied by home-made doughnuts, were enjoyed, and the wearied visitors rested and “passed the time of day.” The doctor and the minister, no doubt, were there in readiness to officiate in case of accident. We find no record, however, of any mishap, and in 1744 the building was completed, and worthy Nehemiah Strong with his wife and children, Nehemiah aged fourteen, Mary aged twelve, and Simeon aged eight, were fairly settled in their new home. Adapted from Historic Homes of Amherst by Alice M. Walker in 1905. Tour the Amherst History Museum housed in the Strong House. Walker, Alice M. Historic Homes of Amherst. Amherst, Mass. : Press of Carpenter and Morehouse, 1905. 1-10. Available at the Jones Library or on GoogleBooks.